What is Aunt Emma’s Auction? Aunt Emma’s Auction is one of the favorite evening activities. 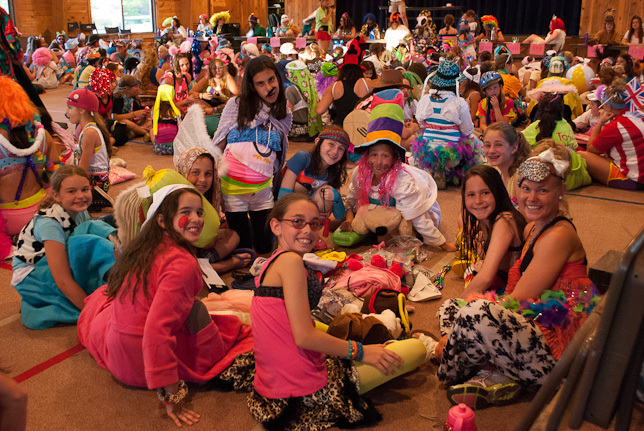 Each bunk, including their counselors, brings a bag of crazy items, and anything and everything that they can wear. Bunks sit together, and Sherie asks the campers if anyone has, for example, a yellow polka dot swim suit. Maybe someone in the bunk has something polka dot, something yellow and shorts and a shirt. They then need to convince their judge that it is close to the item requested. The judge has latitude in awarding points and the combinations are amusing and often hysterical. It is lots of fun and the campers and staff all love it.